I wrote the song Pure Being, quoted above, 10 years ago about the idea of just being with someone, not doing, saying, thinking, just being. I could not have anticipated how this line, which meant something very different to me back then, would become almost prophetic in describing what unfolded 10 years later with my third album Raw Space. 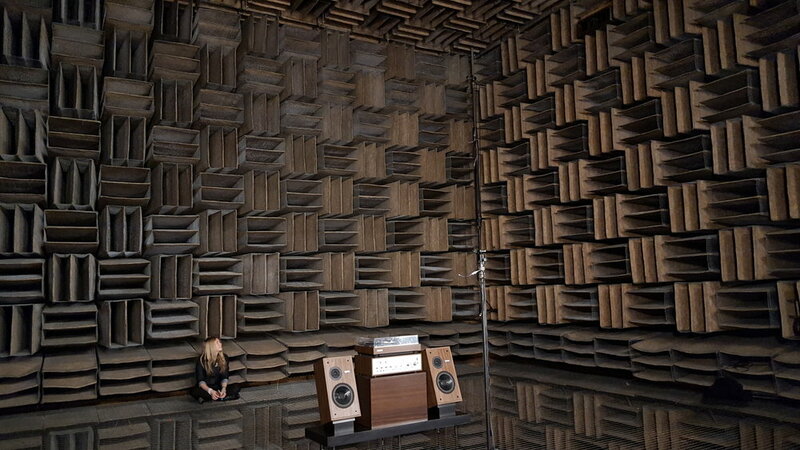 I was onsite at Bell Labs, working on the Human Digital Orchestra performance and Paul Wilford asked if I would like to visit the anechoic chamber (or anti-echo chamber). I had nothing in mind, no idea of the room’s history, its immense breakthrough discoveries and with this perfectly blank canvas, Paul led the way, through a back staircase and passageway (that reminded me of a Soviet Cold War bunker) into this rundown antechamber where he proceeded to open the largest, and heaviest, door I’d ever seen… several feet thick and padded with the same wedges fitting out the rest of the chamber. There were of course no windows in this 15m x 15m room and Paul sealed the door shut as I walked across the bouncy wire mesh floor, which would become my favourite performance space and Elliott’s basement hotel. He had warned me that I might feel funny (people often did), how you could hear the blood rushing through your veins and the strange phenomena experienced by both your mind and sensory input after prolonged time spent in the chamber. Most people couldn’t stay in longer than 10 mins Paul told me. I had my guitar with me and with all this in my mind, went in boldly, without trepidation, for it felt like the room was pulling me into its silence and I wanted to be wrapped up in it desperately. As soon as the door was shut and I could fully take in my surroundings, I felt an immense feeling of calm wash over my body, my heart slowed, I breathed deeper and it felt like all my gills were opening (if I were a fish and had gills). It was like my whole system relaxed, my whole body exhaled and I was just drinking in the silence, the calm, the stillness. Then very slowly I started playing music and observed with curiosity the music in that space, like a tiny delicate thread, so thin, so pure and sinuous. I observed the profound silence between the notes - like a heavy blanket of snow deadening the sound and devoid of all echo - and thought, if music is the space between the notes, then this is music like no other. And finally that quote really made sense to me. As I played, this silence played fine tricks of madness on my mind, making me think the music was stopping and starting, stopping and starting, but I kept on, kept unpicking that thread. The sound was so small, so focused, so laser sharp in its purity, without anything to enhance, alter, blend, soften, smooth - the opposite to a reverberant cathedral. It was beautiful in its ugliness. Because most importantly, it was real. I was hooked. Two hours passed without me even noticing. Unlike the sick feeling I had been warned about, I felt revived. Unlike of the panic of being alone with my thoughts, I felt serene. Instead of recoiling at the rawness of the sound, I wanted more. That was the beginning of Raw Space… hearing what it sounds like in true silence and feeling like a Pure Being. So I decided to leave my mark on the chamber... knowing it would hold my secret: "Close all the windows, shut the door, don't you want to hear what it sounds like in silence?" One of the last sentiments Leonard Cohen expressed before he died was that we had been living in an echo chamber... so I loved the idea of creating the anti-echo chamber experience.